During the latest Facebook quarterly earnings conference call, the company data revealed it is closer to a point where mobile ad revenues and usage will soon outperform desktop ad revenues and usage. Even though Facebook co-founder and CEO Zuckerberg already ruled out the nonsensical “Facebook phone” in September 2012, there may be enough new reasons – Blackberry, for instance – on how the social network may want to take advantage of its burgeoning mobile division. During the earnings call for the third quarter of 2013, Zuckerberg said 48 percent of its daily active users only use mobile devices while 49 percent of its total ad revenues come from mobile ads. Facebook ads raked in nearly $890 million in revenues during the third quarter through the company’s app install ads, mobile engagement ads, and so on. The announcement means the company is heading in the right direction to meet its Q2 prediction that mobile ad revenues will surpass desktop ad revenues by year-end. Facebook mobile MAUs gained 45 percent more than last past year, from 604 million MAUs in Q2 2012 to 874 million MAUs in Q3 2013. 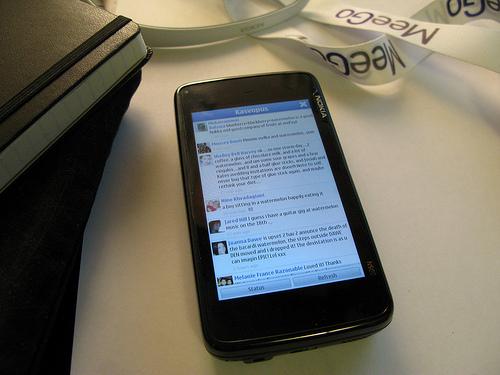 Facebook mobile MAUs include Facebook users who only use mobile devices and mobile users who occasionally use desktop devices to access Facebook services. The 45 percent statistic for mobile MAUs had more than twice as much growth as overall MAUs, up 18 percent from $1.007 million in Q2 2013 to $1.189 million in Q3 2013. Facebook remarked that its statistical figures exclude usage from Instagram-only users, but Facebook COO Sheryl Sandberg delivered figures on the length of time consumers spend on Facebook’s mobile platform if combined with the photo-based social network. Sandberg said Facebook and Instagram accounts for a combined 20 percent of total time spent on mobile devices and 12.5 percent of total time spent on desktop devices every month in the U.S.
Sandberg noted that Facebook accounts for more mobile minutes in the U.S. than the combined minutes of YouTube, Twitter, LinkedIn, Pinterest, Snapchat, Pandora, Yahoo, Tumblr, and AOL, even though comScore research results suggest it may have included Instagram data. The full Facebook slide presentation may be seen from this link, and it includes other metrics such as DAUs and MAUs across mobile and desktop devices. With a total of 1.19 billion Facebook MAUs, the company grew 2.3 percent of MAUs that only use mobile devices to access it, from 19 percent in Q2 2013 to 21.3 percent in Q3 2013. According to the latest figures, Facebook mobile DAUs across the world are up by 38 million from Q2 2013, whereas MAUs are up by 55 million from the same period.